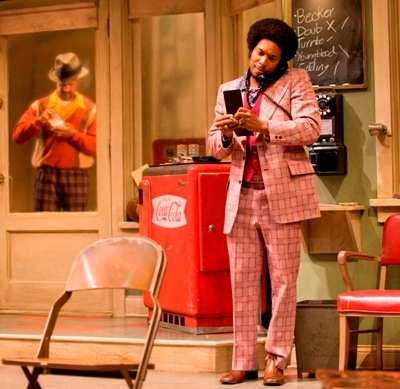 As the lights go up on “Jitney’s” second act, Turnbo and Doub get into a protracted debate about who’s prettier, Lena Horne or Sarah Vaughan. These two past masters at killing time are soon joined by Fielding, and their talk morphs into a three-way riff about how women and money are the two things that get most people killed. 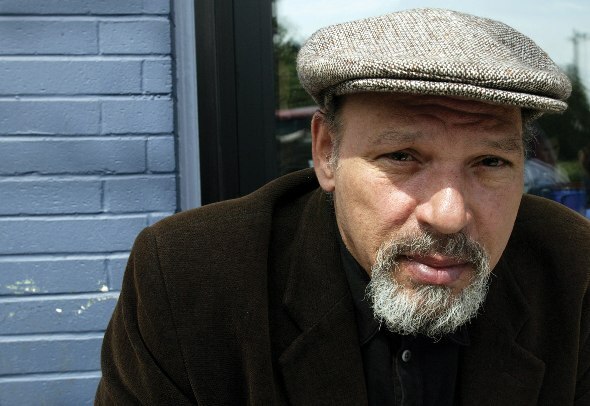 August Wilson’s ‘70s play is about a mercurial crew of drivers, old and young, who run their lives and dream their dreams out of an off-the-grid taxi service in Pittsburgh’s run-down Hill District. Nine well-chiseled characters, distinct in their preoccupations and sartorial ways, tell us volumes about who they are long before we’re regaled with their alternately side-splitting and hair-raising tales. Director Ron OJ Parson and Hyde Park’s Court Theatre have assembled an outstanding Chicago-based cast for this chamber piece writ large. 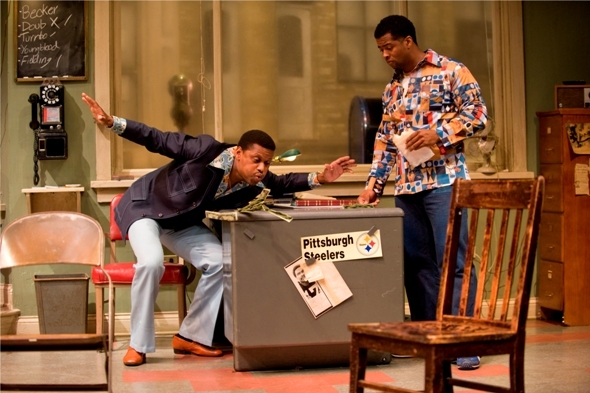 The splendid set, designed by Jack Magaw, implies the fragile reality of this threadbare but orderly haven, overshadowed as it is by a taller, newer building across the street and threatened by that steam roller called gentrification. 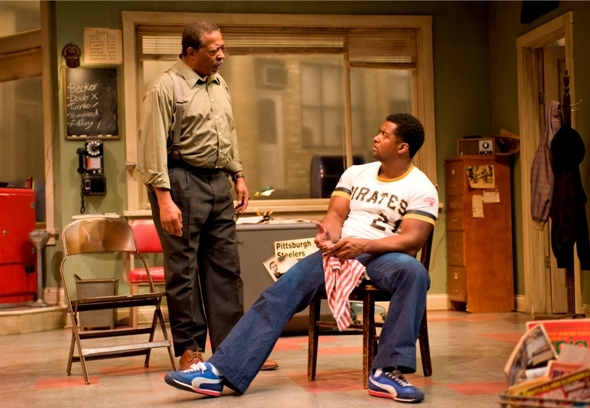 Parson (at right) is a veteran of 20 past Wilson productions as actor or director. He has brought out the best of everyone here, granting the story both its unhurried indulgences and its shocking punches, yet measuring the grand dramatic arc with a steady hand. 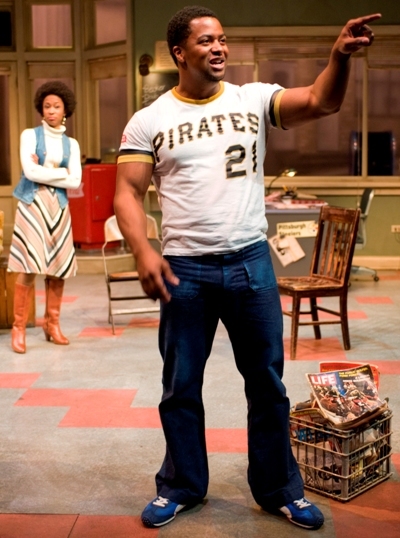 “Jitney” is the first play Wilson wrote that would become part of his epic 10-play cycle, one for each decade of the 20th century. Wilson honed his perfect pitch for banter early, honoring the cigar store connection by giving “Jitney’s” aspiring young lead his own nickname. 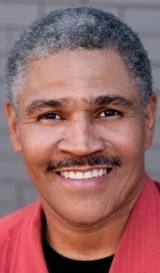 The playwright would re-visit “Jitney” in the 1990s, when his Century Cycle was nearing completion and Wilson had settled into his mature style. But actors pointed out that “Jitney” didn’t have any monologues, by then a signature trait. So the author folded some into his re-write, and the “Jitney” we now have is widely beloved, although it has never made it to Broadway. 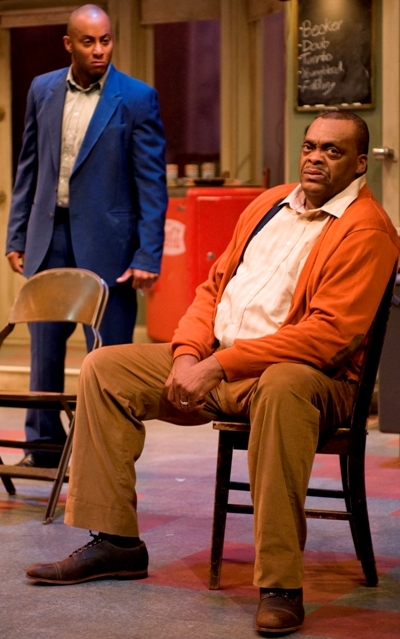 At “Jitney’s” center are A.C. Smith as Becker, reticent and towering, and Anthony Fleming III as his estranged son Booster. The first is a respected owner of a gypsy cab (or jitney) service, rigid but fair, looked up to by three generations of drivers even as they grumble at his posted rules. The second is a convicted murderer who shot a white girl out of passion and grew to middle age behind bars. Smith and Fleming are unforgettable as father and newly-released son in their first encounter after 20 years. Their suppressed crisis erupts afresh and violently, and mutual accusations pour out in Shakespearean waves of psychological tumult and revelation. The nimbly proficient trio of actors who ploy the older jitney drivers includes Allen Gilmore as Turnbo the obsessive gossip, Cedric Young as Doub the steady vet of railroads and foreign wars, and Alfred Wilson as Fielding the booze-felled former tailor to the stars. Their artful diversions are essential spices in Wilson’s highly peppered stew. For romance, there’s Youngblood, a Vietnam vet and lover of cars who is determined to rise in the world for the good of his girlfriend and their young son. His hot temper and a secretive mission, misread by many, get him into some bad scrapes. Played with bursting physicality, and ultimately disarming tenderness, by Kamal Angelo Bolden, Youngblood has several great scenes including an extended standoff with Turnbo that starts with a bicker and builds to high noon. Youngblood’s idealistic aspirations are set against the casual love habits of two friends – Philmore, played by André Teamer, a hotel doorman whose all-nighters get him in trouble at home; and Shealy, played by Brian Weddington, a snazzy numbers taker on a quest to find “the one” by sampling as many women as he can. The skillful comedy of their predicaments offer pleasing counterpoint to the rhapsodic ups and downs of Youngblood and Rena, the girlfriend played for keeps by Caren Blackmore. With Parson choreographing their tentative bumbles as a circling dance of push and pull, Blackmore and Bolden soar.